Once you've uploaded your scouts from ScoutBook™, you can proceed to upload the "Scout Advancement" file from ScoutBook. This will add completed rank requirements, merit badges, and awards to your TroopWebHost database. 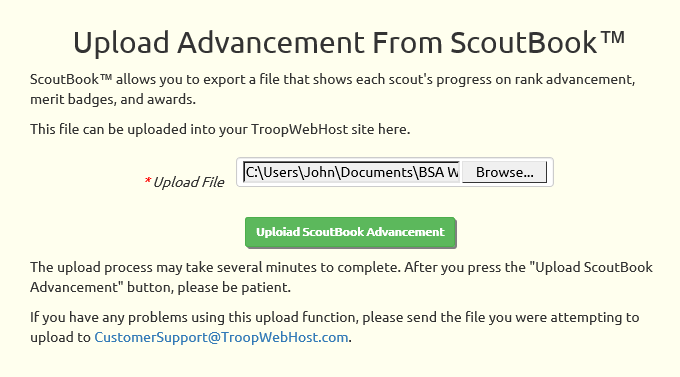 Begin by exporting the "Scout Advancement" file from ScoutBook. Then log on to TroopWebHost, and from the Main Menu go to Advancement → Upload Advancement → Upload ScoutBook Advancement. Click the Browse button to find the Scout Advancemenmt file that you exported from ScoutBook™. Click the Upload ScoutBook Advancement button to begin loading this data into TroopWebHost. This process may take several minutes, so please be patient and do not click the button a second time. The samples of ScoutBook advancement data that we've seen included unfortunate inconsistencies, especially with respect to the version of rank requirements being used. Each row of the ScoutBook file contains the version of the rank, merit badge, or award, that is referenced by that row. This is good, but unfortunately the completed rank requirements for a scout that are included in the file may include requirements for more than one version of the rank. And this, in turn, may be different from the version shown for the completed rank. TroopWebHost will not allow a scout to work on two versions of the same rank. Once we upload the requirement for one version of the rank for a given scout, the upload program will ignore requirements that reference a different version. We've also seen duplicate records for the same requirement and scout. Duplicates will be ignored. The ScoutBook file contains one row for each completed rank. We will use these rows to mark a rank complete, but this means that we will not apply any requirements that are found for a different version of the same rank. If you find this situation, you will need to correct it manually in TroopWebHost by marking the missing requirement(s) as complete. We will attempt to process partial merit badges and awards found in the ScoutBook file by marking individual requirements complete. However, in some cases we track requirements at a different level, so the requirement codes do not match up. In these cases the requirements will have to be entered manually in TroopWebHost. You may also find that some awards do not transfer because the corresponding award name could not be found in TroopWebHost. This may be because TroopWebHost does not contain the award, or because the award name is spelled differently in TroopWebHost. In either case, you can add or update the award in TroopWebHost using the Special Awards page on the Site Configuration menu. Then load the same file again. All of these exceptions will be listed on the screen when the upload completes. Please scroll through all of the upload results and make the necessary corrections before uploading the file again.